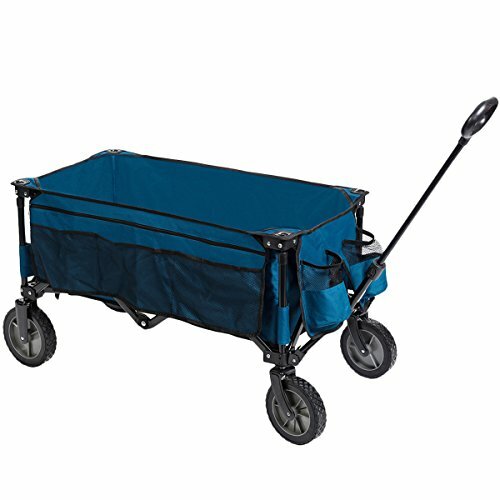 Timber Ridge TR217270BE wagon is a perfect utility wagon/cart for garden, beach and shopping. It is a must-have when you go camping, go to beach or garden, or just move things. Telescoping handle provides an easy control of this wagon on most terrain. It opens and folds up in seconds, quick and easy. With a sturdy construction and durable 600D polyester, it supports up to 150lbs weight capacity,it's enough to take a large amount of daily items. It will not take up too much space as it can be floded up. 1. Do not leave in the elements, as the metal parts may rust. 2. Check stability regularly. Screws may loosen and need to be tightened. Timber Ridge is a professional outdoor brand which devotes to provide best outdoor experience for customers. Our products cover different fields on outdoor activities including bags, tents, wagons etc. All the products are subject to multiple strict quality tests on different extreme environments before entering market. We have reasons to believe our quality products will meet all the needs on outdoor activities.